Pfizer Inc.(NASDAQ: PFE). The Group's principal activities are to discover, develop, manufacture and market prescription medicines for humans and animals as well as many of the world's best-known consumer products. The Group operates in two business segments pharmaceuticals and consumer products. Pharmaceuticals segment includes prescription pharmaceuticals for treating cardiovascular diseases, infectious diseases, central nervous system disorders, diabetes, erectile dysfunction, allergies, arthritis and other disorders. The major revenue generating pharmaceutical products are Lipitor, Norvasc, Cardura, Accupril, Zithromax, Viracept, Zoloft, Neurontin, Viagra and Zyrtec. Consumer products segment includes consumer health care products, confectionery products, shaving products and tetra fish products. Pharmaceutical products accounted for 84% of 2001 revenues and consumer products, 16%. 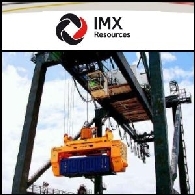 Reporte del Mercado Australiano, 20 de diciembre de 2010 incluye: IMX Resources Limited (ASX:IXR) embarca su primer cargamento de hierro-mineral de cobre a China; Phylogica Limited (ASX:PYC) firma convenio de colaboración y patentes con Pfizer (NYSE:PFE); Copper Strike Limited (ASX:CSE) recibe altos resultados de cobre/plata/cobalto en Walford Creek, al noroeste de Queensland; South American Ferro Metals Limited (ASX:SFZ) excede su producción de mineral de hierro en Brasil por 40,000 toneladas.